Porter talks about his injury, he remembers the injury first occurred about two years ago while he was playing he jumped and was hit in the air and came down to the floor flat on his back. The injury became worse in a few weeks causing debilitating pain. 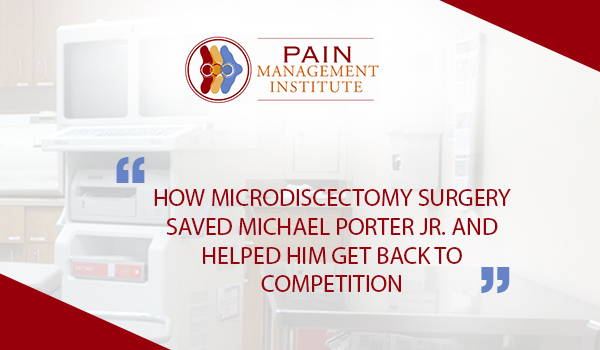 Porter and his parents planned to travel Chicago, Frankfort to visit the Pain Management Institute, where after a complete physical examination, they were given multiple options by Dr Zaki Anwer, Pain Management Specialist and Medical Director. And it was eventually decided that Microdiscectomy spinal surgery is the best option. Because of my severe back pain “I had forgotten what it is like to play normal”. “That’s why I’m blessed to have visited Dr. Zaki Anwer and had Microdiscectomy as because of the surgery, I’ll be far better than I was playing without those limitations”. The patients undergoing Microdiscectomy Spinal Surgery primary need physical therapy as a way to recover soon. Porter said his physical therapy includes not sitting for longer periods. Porter said “He believes he will recover soon from the back surgery and eventually be 150 percent fine”.